After our run to Half Price Books this afternoon, I decided to plop down in Husband's manchair to read for a while. Only, before I could plop into it, I had to clear it off. And there, in the chair, was a stack of old photos. Husband said they had fallen out of the closet and he hadn't gotten around to putting them back. They were all from the spring of 1995. Middle Daughter had just turned two. 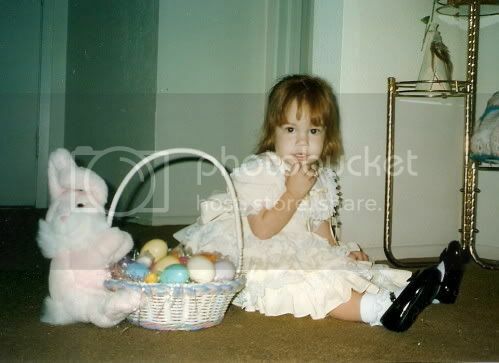 Here she is on Easter. It's funny to see her in this dress, since these days she'll only wear a dress under protest, and certainly never one with ruffles. 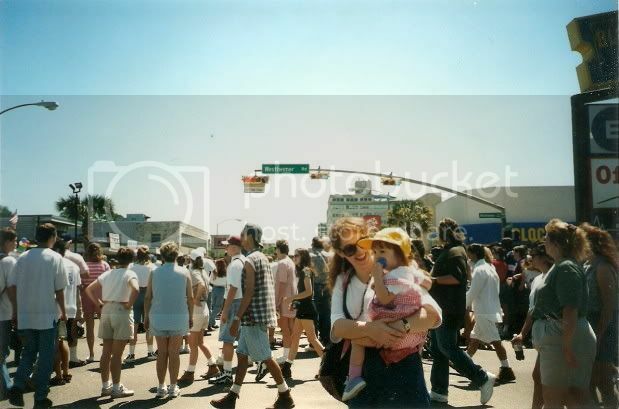 This one was taken at the Westheimer Art Festival, back when it was actually on Westheimer. I love how everyone is moving, looking in the same direction, except us. Back then, I often felt like it was just the two of us in the middle of a world moving on. And just one of her being cute. 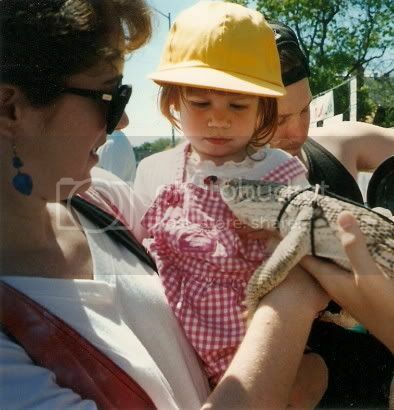 She never could decide if she liked this lizard or not. I still wear these earrings. Here we are in the bluebonnets. I thought I was fat then. For the record, at the time I was 20 pounds lighter than my goal weight is now. And finally, a picture of my Aunt Jo with my mother. She had already been battling for years the cancer that eventually killed her, a year after this picture was taken. 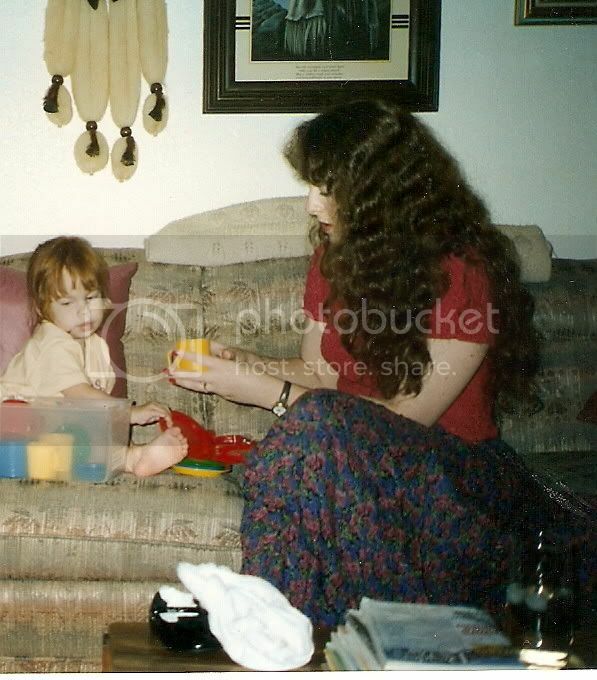 In this picture, my mother is not much more than ten years older than I am now. Far too young to lose a sister. I LOVE the Bluebonnet Pictures. Ha - that would be HAD amazing hair. Today? Not so much with the amazing. These pics do make me want to grow it out again, even though there's something a little weird about the thought of having hair that long at my age. I'm more amazed that I had time back then to paint my nails. Next year, I'm going to drive out to Hemptstead and take bluebonnet pics again. I haven't done it in ten years. Your hair is fabulous! And look at tiny middle daughter! Awww. They grow up so fast. They do! I had forgotten what a wee thing she was - The Boy was bigger than this before he turned one. Beautiful hair!! I love the bluebonnet picture. You look so yound and so beautiful...What did middle daughter think of all these pics?? She was just adorable!! about 2 years before I 'met' you. I can't believe how she has grown. I still question what you were thinking by cutting your hair. You're mom and aunt are striking women. In that picture, they could pass for twins. I adore that picture of you two in the flowers. Can you believe how long we've known each other? The time has just flown by. For a couple of years, my mom and my aunt had the same frosted hair - now in pictures from then we have to look hard to figure out which one is which. I love the picture of us in the flowers because she isn't paying the least bit of attention - it's so her. These pics are fantastic! 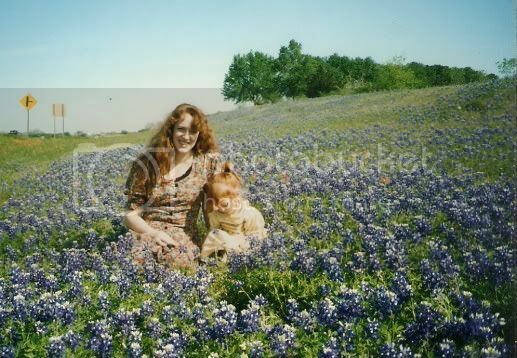 The bluebell pic looks like a shampoo ad and I LOVE the one with you holding middle daughter on the street. And what a good sport middle daughter is being with a ginormous man-eating reptile coming up to her face for a smooch! Are you named after Aunt Jo? Seems like a no-brainer but you never know. Your mom looks like her sister - lovely. And yes, that is far too young to lose a sister. I sort of am and am not named after her. Her name was Jolene and everyone called her that; only the nieces and nephews called her anything else. My parents intended to call me Ellen, but couldn't find a middle name they liked. So, they stuck "Jo" on the front, and were going to call me by my middle name (my sister goes by her middle name, too). They didn't tell anyone what they planned to name me. Then, after I was born, my Aunt Jo showed up at the hospital, exclaiming, "Where's that baby who's named after me?" It was just a joke, but she kept it up so long that eventually everyone started calling me Jo. Except my paternal grandmother, who thought Jo was a terrible name, and insisted on calling me Ellen until the day she died. That is one gorgeous mane of hair, dang. 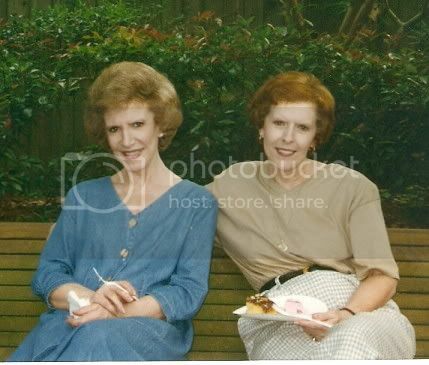 And your mom and Aunt Jo could really pass for twins in that picture. Beautiful women. And finally...MD is so cute! How many kids do you have? MD is the middle of three...Oldest Daughter is 18, MD is 15, and The Boy is 6. Loved the photos of you and middle daughter. She was and is such a doll! You remind me very much of Amy Yasbeck. You know, most women would kill to have hair like yours!